Ryan currently works as a Freelance Sculptor (both digital and traditional) and has done a lot of life-sized busts for Sideshow Collectibles. Ryan has done a lot of high profile work including a lot of film work with people such as Rick Baker. Ryan currently has a modest studio here in Utah that he works out of. I love spending time with Ryan in his studio, he's always working on some incredibly fascinating piece and he's a pleasure to talk to. Always super generous with his time. I got to know Ryan when he worked with us for a short time at Disney. If you would like to see more of Ryan/s work, you can check it out HERE. Thank you so much, Ryan! Judge #2 is none other than Joe Menna! Joe Menna is an incredibly skilled sculptor as well as a wonderful human being. Joe loves to share his experiences and gratitude with others via Facebook Live, which is always fascinating to watch/listen to. 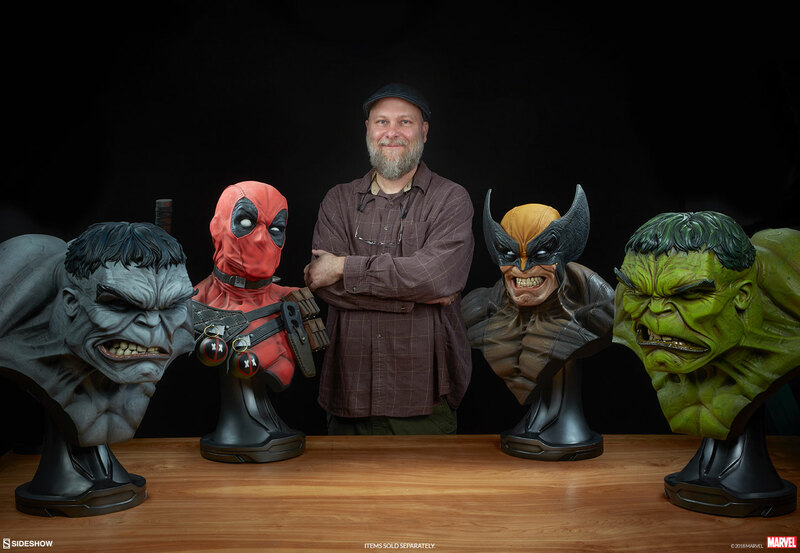 Joe has been working in the collectibles industry for years, and he has also done several pieces for Sideshow. 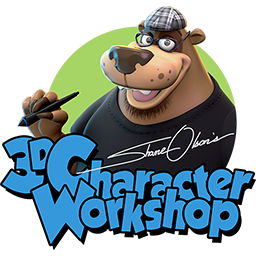 Recently, Joe did a presentation at the 2018 ZBrush Summit where he cut and keyed a full character. You can watch that presentation HERE. 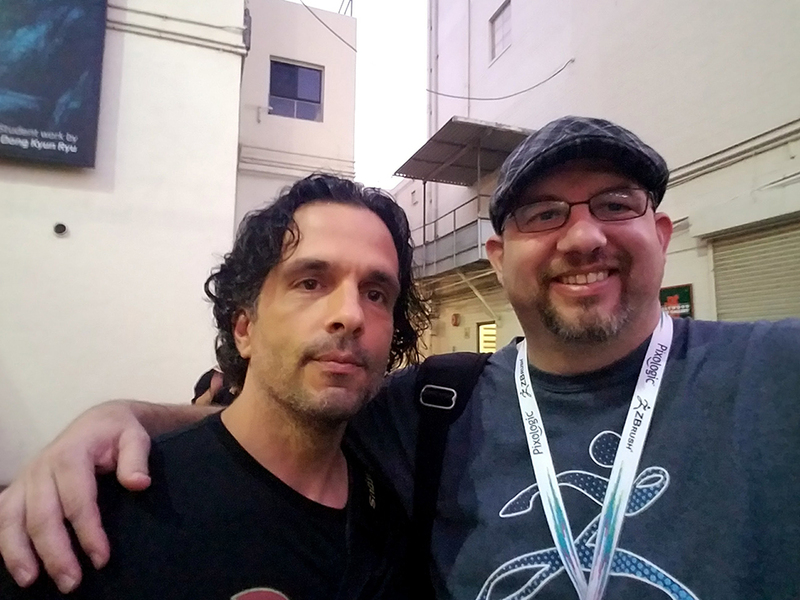 He also did a great interview with the folks at Pixologic. You can listen to the podcast that HERE. Thank you for your time, Joe! Judge #3 is the Powerhouse Art Director, David Igo! 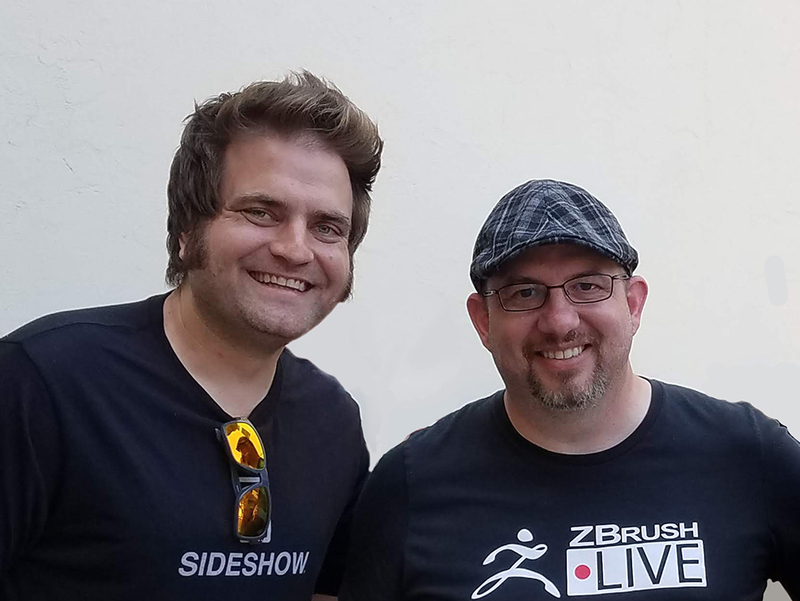 David is the Art Director for Licensed Products over at Sideshow Collectibles! Not only is David Igo an incredible talent he also has an incredible personality. You can't help smiling while talking to him. He's hilarious! I think this is the only picture I've seen him not pulling some crazy face (next time David, next time!). Haha. What makes David such a wonderful Art Director is how he goes about his critiques. He's is very respectful, thorough, and knows what he's talking about. You will see what I mean in his comments below. 2) Is it Produceable? This is the thing I'll probably be leaning on the most since I'm sure these students are always getting awesome art feedback... This will make or break most pieces." Shane: "I wish I would have come up with that criteria. Next time I will make sure the students follow this more closely. Love it!" You can see a great video of David walking you through the Sideshow booth at Monsterpalooza in 2017 HERE. David: This one scores a solid 90% with me... It has everything that a collectible needs - focuses on the character and has great character (you know exactly what they are thinking), a nice base (doesn't always have to be environmental) everything is grounded /solid/producible (nothing floating at all) the paint works and feels like it would be price-friendly... SO BOOM! No worries there... Also, it feels like something I could easily see myself owning and having on my desk. I feel like I've seen this concept before (is it from someone else's concept?) Also, feels VERY Halloween'y to me - love that it's a kid dressed up out collecting the goods, but captures that moment of a scary unknown... that's everything Halloween to me! Id say the paint could be pushed a bit more with some painted in highlights or shadows, and it'd be great if there were a tiny bit more figure and base interaction, even if it's just some of his candy spilled onto the floor or a couple of leaves to make it feel like he's on someone's porch. But again, great execution, great character, feels totally producible and like something I could buy right meow... totally solid. Shane: I love everything about this one! The colors are all in the same value family, the level of detail across the board is really nice. The "story is really sending a message. I want to know what he's looking at that has made him so scared haha. Very nice work!. Ryan: I like the sense of humor in this piece. In addition, everything is solidly modeled. I particularly like the face. Well done. What to work on: Try bringing the details of anatomy, clothing and pose up a notch. This is always good practice. Joe: This is a great statue in all respects. The pose is fantastic, the expression right on, and the story is supported by an overall great composition. 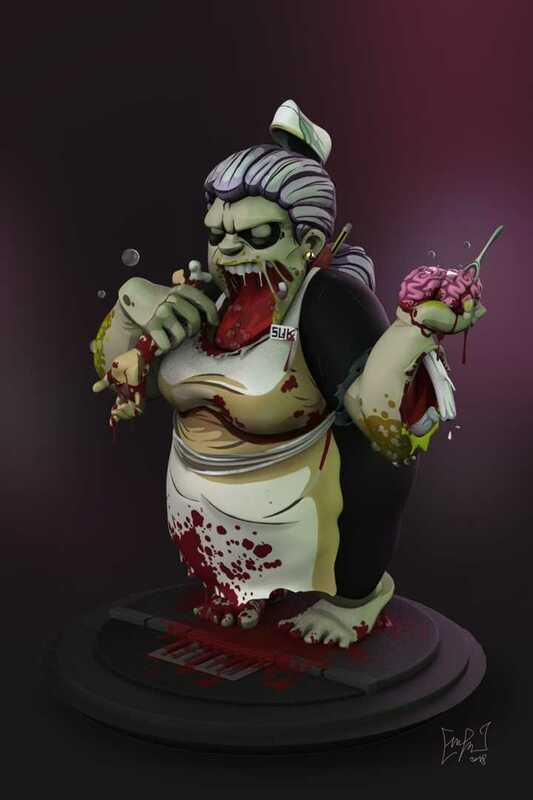 It’s well sculpted, looks like something I’d want to buy, and is professionally presented. It’s definitely my favorite but I’d have liked to seen the tiles sculpted with beveled edges and not just textured. David: This is a really fun piece, has a lot of great stuff going for it. 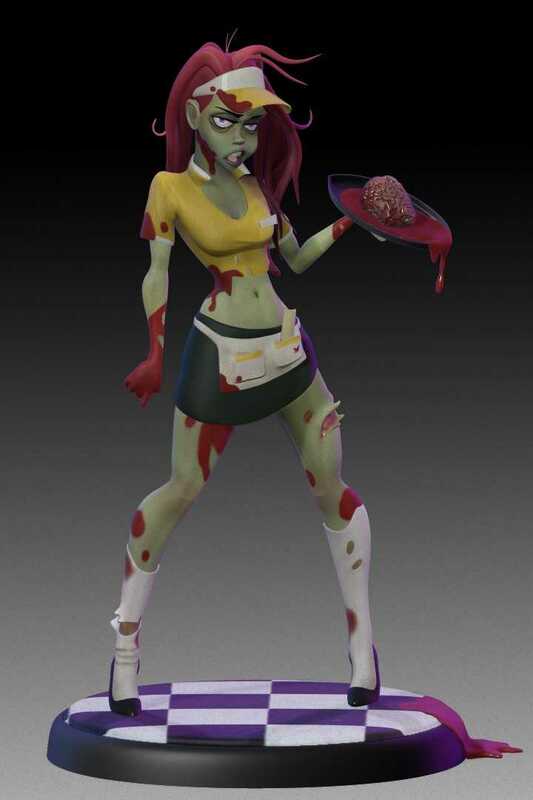 Zombie Waitress Babe! I feel like the brain on the tray could've been pushed more to match the rest of the piece, but it's a super fun piece with tons of attitude! Shane: She is one of my faves from this challenge. I really like her hair, her face, and her pose. Lots of nice things going on. I think she could benefit from better lighting and background to make her pop. Also, the blood is a bit on the saturated side and calls a little too much attention to itself... other than that' well done!! 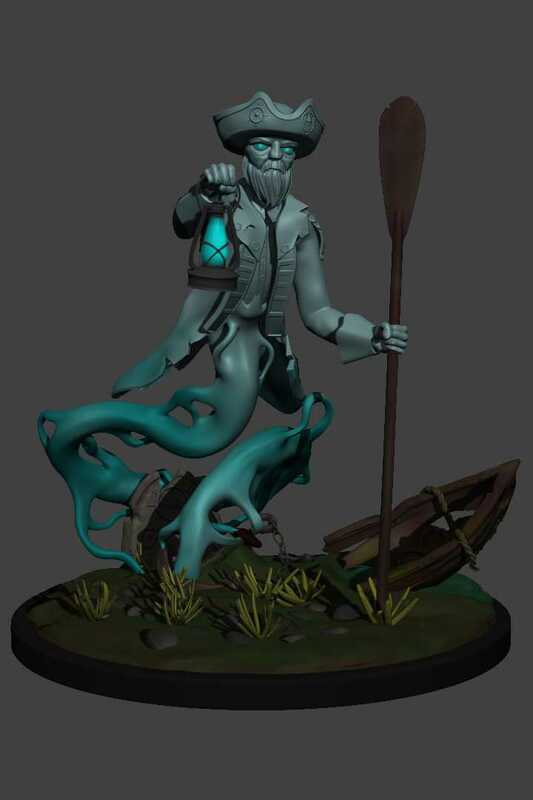 Ryan: A very nice sculpt. In particular, I really like the hands and feet. 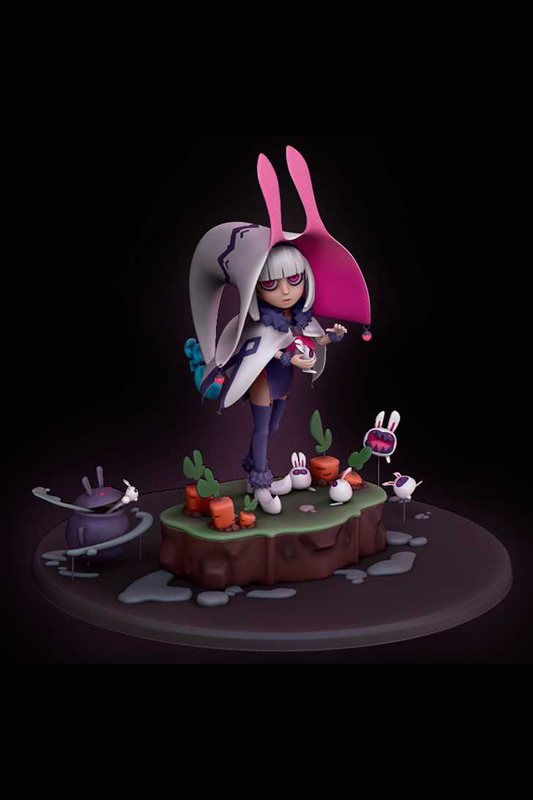 In addition, this is a complete piece, in that, it appears 3d print ready. What to work on: In the future, try something more ambitious – multiple characters and objects (Ryan didn't know about the Gremlin at this time). Also, keep working on anatomy. This will help you to find the nuance in a character’s facial expressions. Joe: This piece tells the story via a great pose and expression while making the base an integral part of the sculpture. The sculpting is handled well, it’s appealing beyond just the familiarity of the character, and the over all presentation is on point. David: GREMLINS!!! GIZMO!!! I mean, cmon! It's a great Gizmo piece, tells a story, and feels very producible. I would've pushed the pose a bit to make him feel a bit more balanced (have him leaning back over his grounded foot) but still a fun piece! Shane: Yes! Who doesn't love Gizmo? You did a great job capturing the moment. I also love the follow-up piece you just posted. I am selfish and want one of my own! I promise not to feed him after midnight. 4th Place is a two-way tie! Ryan: By the numbers, but well done. I really like the hair. The pose could be more fun. Still, this is well executed. 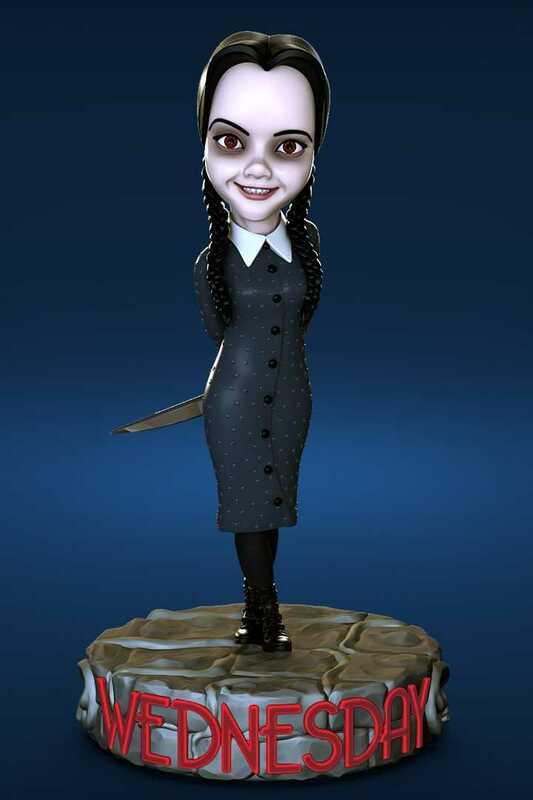 Joe: This piece represents the character in a very effective way, much like a lot of popular female collectible statues do using a hint of coyness supported by some kind of prop. It’s well sculpted, definitely looks great, and is presented in a way that complements the entire sculpture. David: I LOVE Chris Sanders so I'm slightly biased but it's a great translation of his work... Chris really pushes the character in his work, and this artist nailed it... it's not just a girl standing there, but the way she's standing there has a rhythm and flow to it, she feels alive even though she's static. 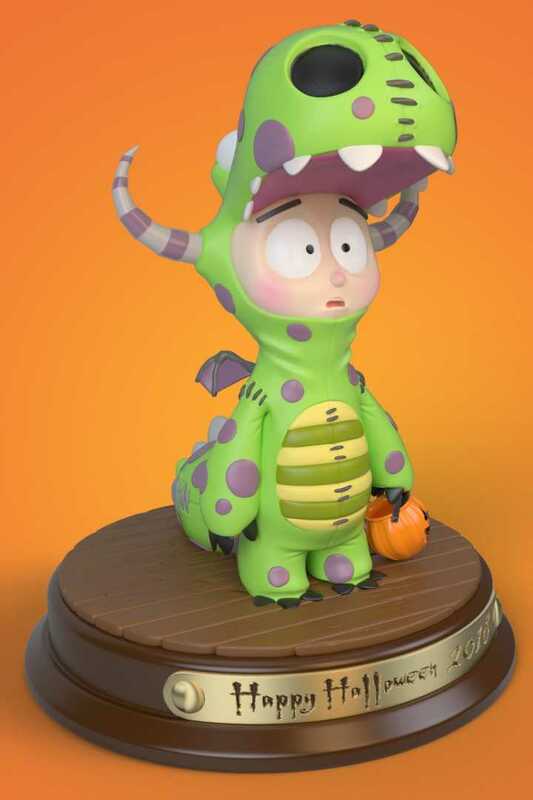 Two things that are keeping this from a near perfect... First, the Pumpkin she's holding, it's hard to tell if its face (eyes and mouth) are sculpted in or are decals. You gotta be a bit more decisive with it and make it clear to the collector/purchaser knows what they are getting best they can. Also, feels like a missed opportunity for an awesome light-up feature! If it was intended to light-up, again, clarity... doesn't feel like it does to me based on the image. Second, in the original source art, there are decals/patterns on her leggings that are missing here. Most people probably wouldn't know where this is from so they wouldn't care, but you gotta cater to both "every day / casual buyers" and "fans/collectors" who might be familiar with the source material. But overall a really solid piece. Definitely, little things here and there to get it closer to Chris' work, but it's still really solid, very producible, and is something Id want to own. Shane: I LOVE how she turned out!! The hair is great, the face is very appealing, and you've captured Chris' concept very well! Congrats! I do think the weakest part is the base if I have to pick on something. I would make it a street, or a pumpkin, or something that is recognizable is all. Very nice! Ryan: Nice touches. Refreshing character design with a lot of fun energy. The paint job is distracting though. All in all, a nice piece. Oh, and I LOVE the broken arm bone! David: Great character, great story, feels like a statue (ie - it all feels solid and producible) but it really has everything... the one bit that really made it EXTRA stand out to me is the paint application. It's not just flat painted, but the artist really chose a creative way to work in some graphic elements painting in highlights and shadows. It does feel like it'd be slightly more expensive with all the parts and paint hits, but that's not a bad thing at all, just something for people to be aware of with collectibles... The ONE THING that probably knocked it down a tiny notch (and it's minor, but it's collectible 101) is the floating bits... NO FLOATING BITS! It's super nitpicky but I mean cmon... You literally can't make things float unless you have a rod or support of some kind or some super expensive magnet technology. But, again, nit-picky but it's important to address items that don't work for the objective ie - collectibles need to be producible. But man, what a fun and ambitious piece! Shane: I love the graphic nature of the colors on this one! What to work on: Simplicity. If this piece has a weakness, it may lie in its over-ambitiousness. The pumpkin, which is wonderful, is almost too much – one too many elements. Try focusing on a single, humanoid character so you can explore anatomy; of which, you can never explore enough. I’m nit-picking though because this is a GREAT piece! David: INSANITY! 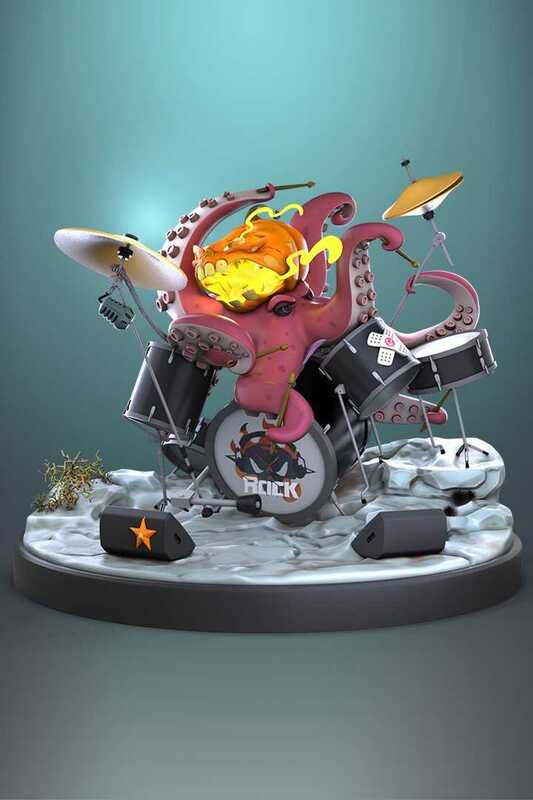 I have no idea where this concept came from but the idea of a rock-n-roll pumpkin-wearing Octopus playing drums is insane haha! It's just a bit hard to tell what's what with the piece, there's a lot going on and clarity is important... I had to take a second or third closer / harder look to make things make sense, and the base environment is hard to read exactly what the setting is, but man this was almost in my top 4! Shane: I love the motion in this one! So dynamic! I don't think it could be printed as David said, but it's way fun to look at! the pieces, this one makes me smile the most. Joe: This piece is a great integration of the figure and base to tell the whole story. While the base is big, it doesn’t overpower the character and instead serves and a great pyramidal lead up to the crescendo of the composition. It’s very well sculpted, great to look at, and is very well presented. Shane: I love the silhouette of this one. I feel like the colors are a bit too saturated. I would like to see them brought into a more similar color family. Ryan: Well done. 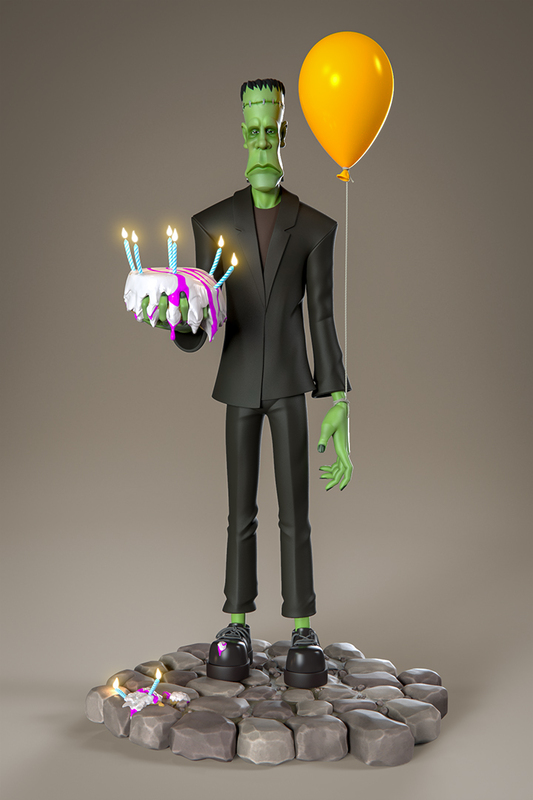 The cake is a nice counterpoint to Frankenstein’s stiffness. An impressive piece. David: I LOVE this piece... huge Frankensteins Monster / The Monster fan, so we can get that "I just LOVE Frankenstein Monster stuff!" 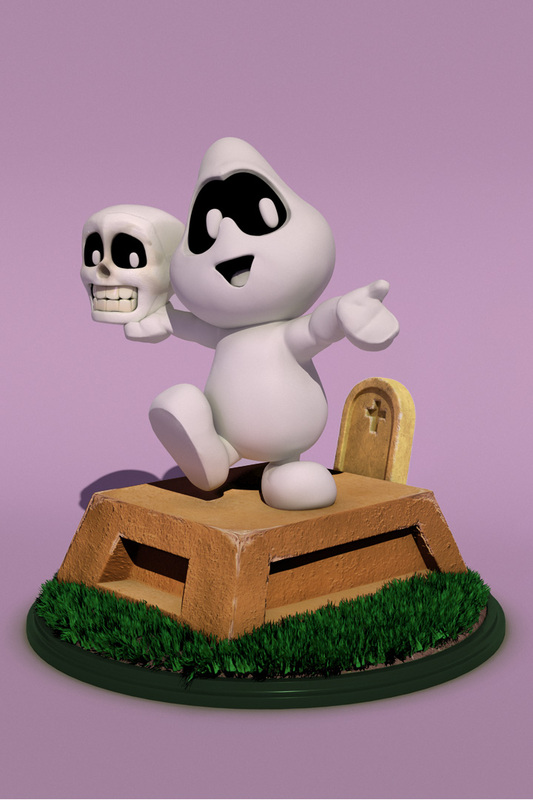 out of the way haha... the thing that's most important to me is how everything works together for the character, the base, and production... it tells a clear'ish story (Happy Birthday Halloween? I'll take it!) and is very production-friendly. I love how he's holding a cake with that hand and it's spilling onto the floor (figure and base interaction) and how the candles are lit-up (LIGHT-UP FEATURE! BONUS!) and how the balloon is being held up by the string (that could be a wire) so again, feels producible... It's a fun piece, feels very Halloween to me. My biggest gripes are the character could be pushed more. He has GREAT hands in this piece (the hardest thing IMO to get great character with) but not much else... He's just standing there and feels very stiff. Even for a character like The Monster, you can still get some character into the pose without making it feel out of character. More hunch to the torso, arms could be kinked out a bit more, slight shoulder dip to get some a-symmetry in there, etc. 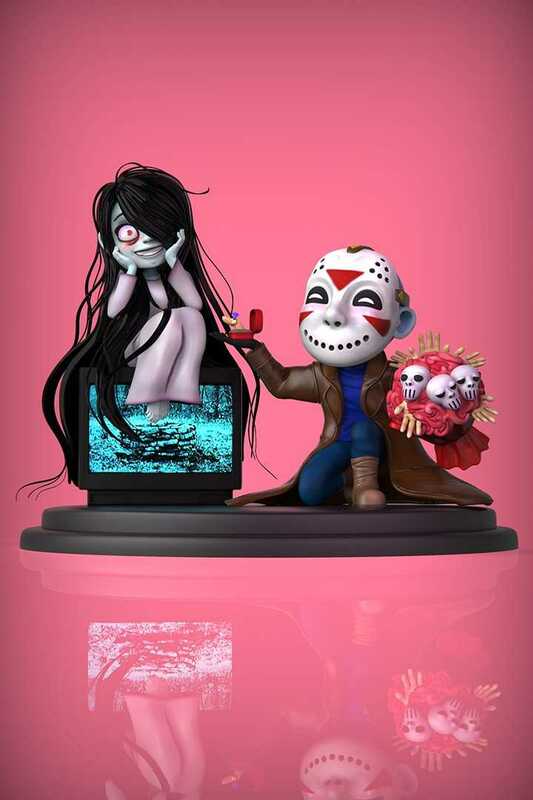 But, it's still awesome to me... is very Halloween'y to me and is a super fun piece. Shane: The presentation on this one is fantastic. The lighting is top notch. Very nice work! Ryan: Ambitious and interesting. The concept is a bit unclear but I find the creature intriguing. Overall, some nice effort went into this. Good job. David: I love the design of the girl and the story this piece tells, but it feels like a lot of elements are just shy from being pushed to their full potential, they all could be pushed a bit more here or there... and I had a hard time immediately being able to tell what was going on with the monster guy. Fun design just needs to be a bit tighter for clarity. But super fun piece! Shane: I love this one. You nailed the concept. I wish the background was a bot lighter, or you had a rim light to break the piece away from the background. Great job. to not compete with the witch so much. I love the color scheme and concept. A really nice piece. David: LOVE IT! Almost made my top 4, I just couldn't tell what everything is (stuff on the hat, just gunk?) and there are some unproduceable aspects (flies not being grounded, that one bubble) but it's still a really fun piece with a lot of character! Shane: I think you hit the concept right on! I'm glad you fixed those hands! They look much better! Ryan: There are some great sculptural flourishes going on here - wonderful angles and proportions. Its “cuteness” is kind of predictable, ubiquitous. I would try another expression, just for variety. Perhaps one of concentration, with her brow slightly furrowed and her tongue slightly sticking out. Just a thought. All in all, it’s a great piece. David: I absolutely love this piece, tons of character to the girl, but two of the big storytelling pieces (the pumpkins) are both floating and so is some of their candy... you couldn't make it (as a real statue). 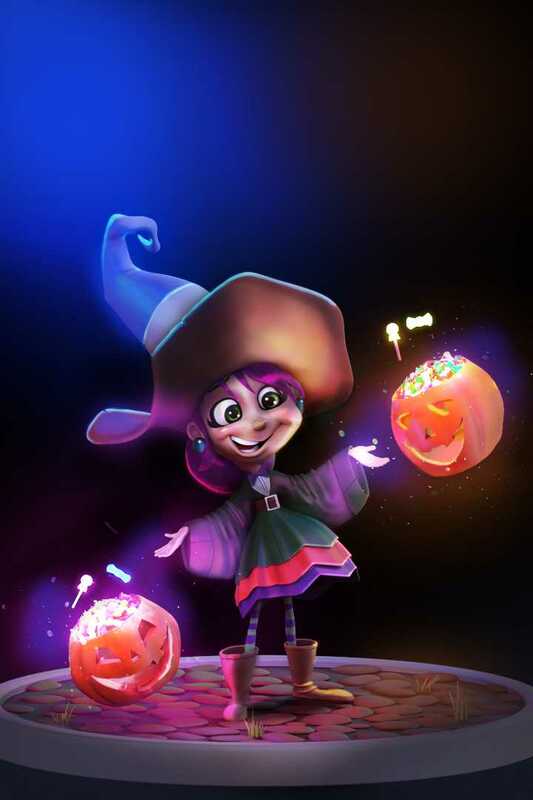 There's always a way to get things suspended, rods, elements from the piece - like the magical candy coming out of the pumpkins and swirling around either attaching to the girl or the base could've been a really fun creative way to make those suspension gags work. But it's still an amazing piece with tons of character! Shane: Nice work on this one Carlos. I think she is super appealing. The only problem is (and I've had this problem as well), she seems over-produced. What I mean by that is, the post-processing and lighting is taking over, and she doesn't look like a three-dimensional model any longer. She looks more like an illustration. 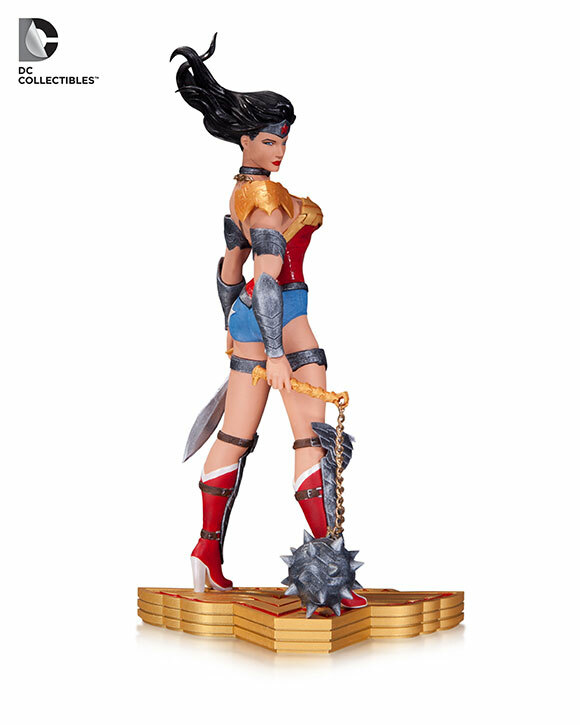 Not that there's anything wrong with that, but it makes it harder to read as a sculpt. 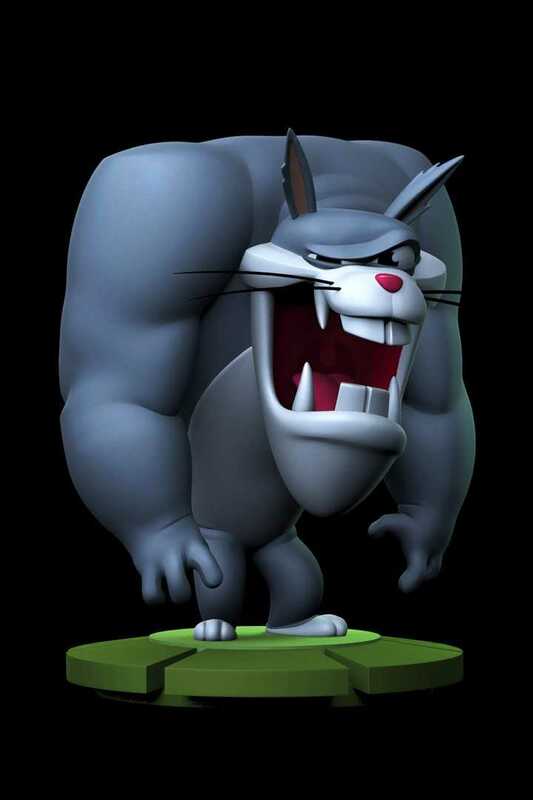 Original Concept by: Looney Toons Warner Bros.
is one. Perhaps, he could be holding something that would allude to a concept. 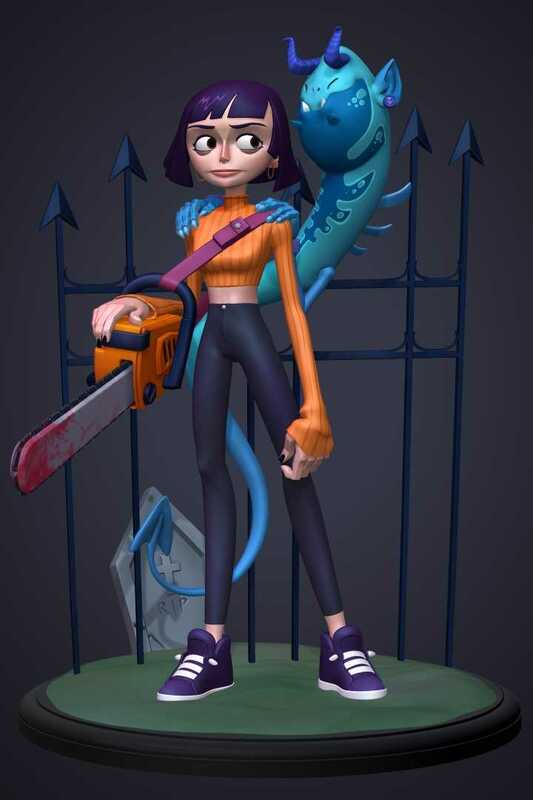 This character would look great as a 3d print. Shane: I love this guy! Very well designed with clean lines. I think his hands could be a bit stronger/more developed. But that is minor. Ryan: Likenesses are hard to do and this one works well. A few targeted tweaks – more stylization and proportional dynamism - could help. Good job! Shane: She turned out great! The likeness is there. I think the red letters on the base are a bit distracting, but not too bad. Nice work. Ryan: It’s a cute piece. A bit safe, but I like the pose and expression. I guess I just want to see more components in the composition so detail can be added to contrast the simplicity of a white ghost. Shane: This guy is full of appeal! 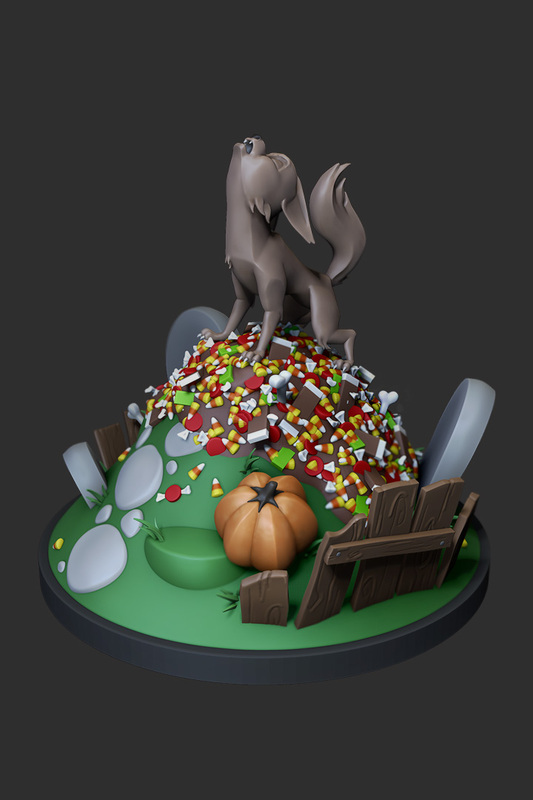 I would probably lessen the detail on the grave, and simplify the grass a lot! The grass would not be producible as a collectible unless you literally glued fake grass on there (which could work). Also, I think you could reduce the saturation on that grass as well to bring it closer in line with the color of the grave. Great work! Ryan: An odd/interesting piece. 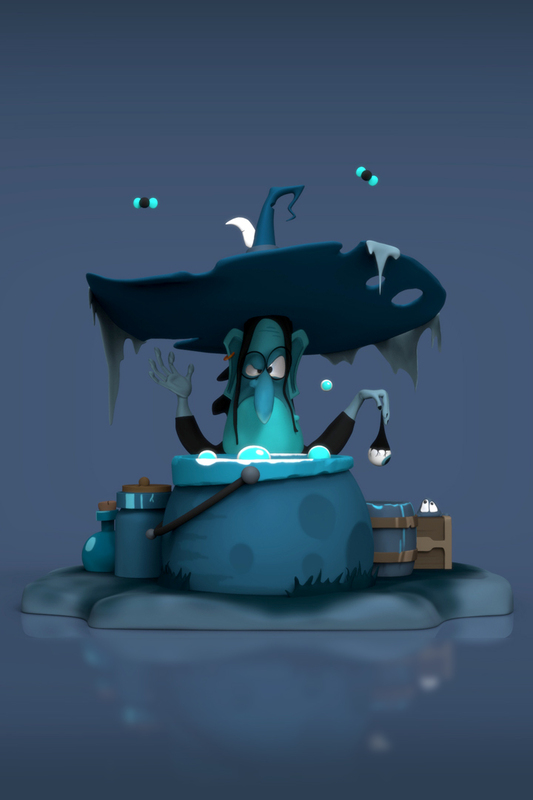 The presentation is a bit awkward, but it has some nice touches – the broom, for example, is wonderful. Nice ambition on display. Shane: I like the overall feel of this one. I think a better lighting setup would really make this one shine. I'm not sure why, and I know you were matching the concept, but that back leg still feels strange to me. Like it's not in a natural position. I don't know what it is exactly. I might play with the pose and length on that one. Ryan: Nice character design. A bit simple – not very ambitious. The face could use more asymmetry but, all in all, a nice job. In the future, add more complexity – props, paint detail, etc. Shane: I think all this guy really needs is a polish pass. If you were to go through and really punch the details up, I think it would shine. Also, a good lighting setup would help. (I'll work on getting a better lighting lesson in the course). Ryan: Very fun concept. Nicely done. Maybe it needs more compositional dynamism (?). I don’t know – this is a tricky one because it’s so well done. Perhaps if the t.v. were replaced by the well itself there would more visual opportunities (I know this is referencing THE RING but the well alone would still convey that). If anything, it would provide more creepy texture and could elevate her higher in the composition, making it more dynamic. Still, this is a great piece. Shane: I like the concept behind this one a lot. The girl's hair is great. I like the emotion. There are just a few small polish things I would push. For example, I would work on getting the clothing (like the coat and her pants) to look more natural. Good job. the hat and little creatures, so maybe that’s a good thing. This piece shows a nice effort. Well done. Shane: This one is really fun! I love the composition and all of the colors. What I would focus on are better hand poses, and trying to get closer to the concept. You are really close, but there are a few more nit-picky things that could take it to the next level. For example, the black eyeliner is quite heavy and giving her a different feel than the concept. Just little nuances like that. But overall you did a great job! Ryan: Nice concept. 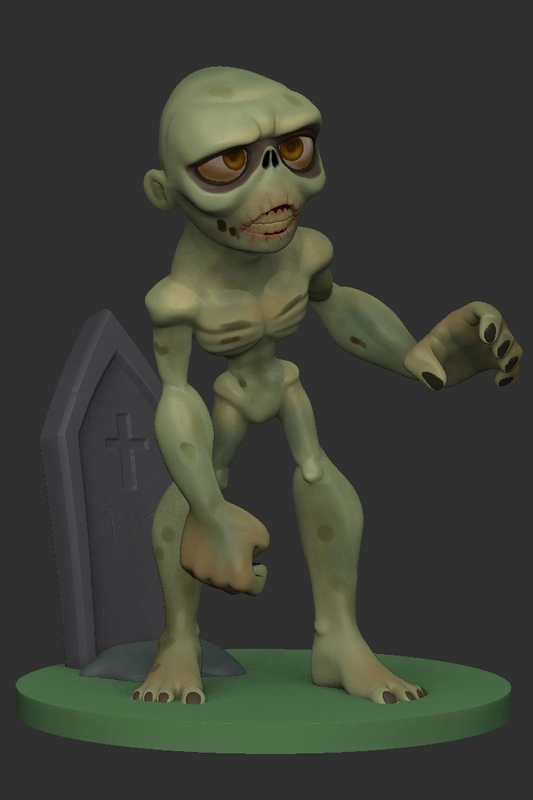 Sculpting is a bit “soft” though. In the future, think about adding more planes, angles, and creases. I love the face! Shane: I love the idea behind this piece. It would be a fun engineering challenge to try and get this to work as a print. Ryan: Fun subject matter. Sculpting, pose and composition needs more dynamism. Still, this piece has great ambition and potential. A good effort. Shane: This is a great idea! I like how clean and smooth it is. I would like to see just a smidge more detail in places, as well as a little more variety in the mane and the planks. 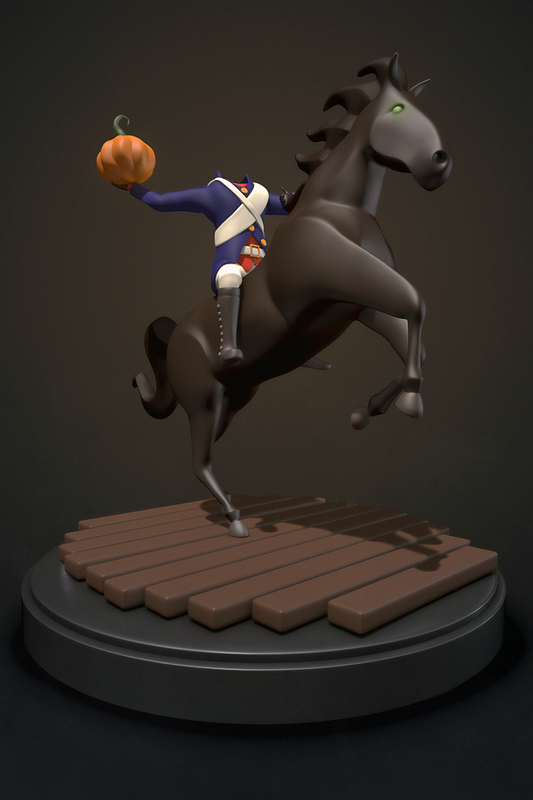 The thickness of the legs would need to be increased, and the horse rearing even further in order for this to work physically as a real collectible. Nice work. Shane: I like the bear idea. 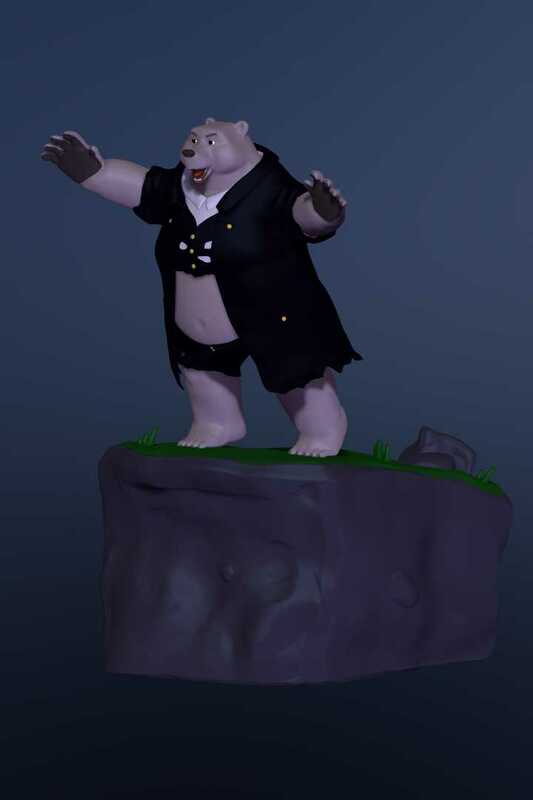 It's like a werewolf, but a Bear. I think he could benefit from better lighting, and not so saturated colors (no black, blacks.) All of the detail in the coat is getting lost. Then, what Ryan said, a smaller base would be helpful. Ryan: Strange piece – a bit spooky, which I like. Poor render, though. It has potential. Play with stylization more, perhaps in proportions. I think, conceptually, you’re on to something kind of interesting because this piece has a strange mood to it. This can be a good thing. Shane: I am liking what's happening here. 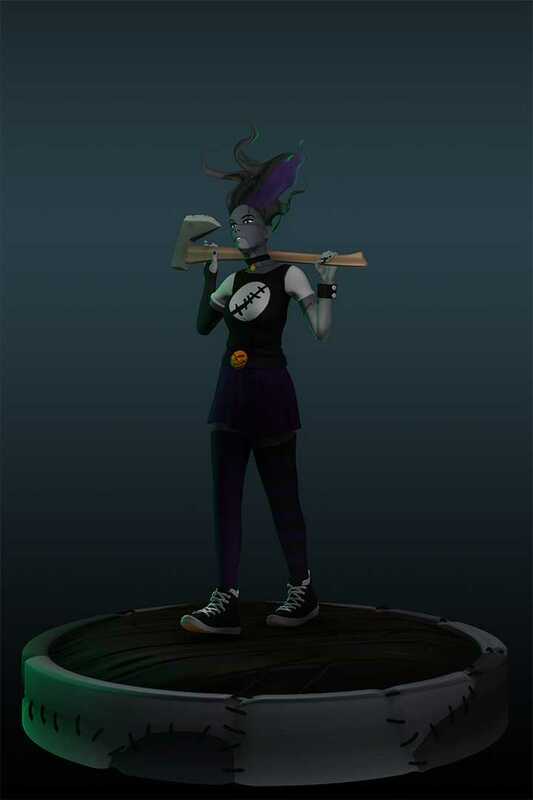 I would give her a slightly more dynamic pose, better lighting, and I wouldn't go so black with the blacks. All of her detail is getting lost. Also, the base is really large. I would shrink it down to at least half if not more. That being said, her face is appealing, and her hand poses are nice. Good job. Shane: I really like the cleanliness and the idea behind this one. Although it is difficult to understand what is happening. The hair is super nice, and so is the face and the lighting. Awesome job! Ryan: This is a very pleasing piece. 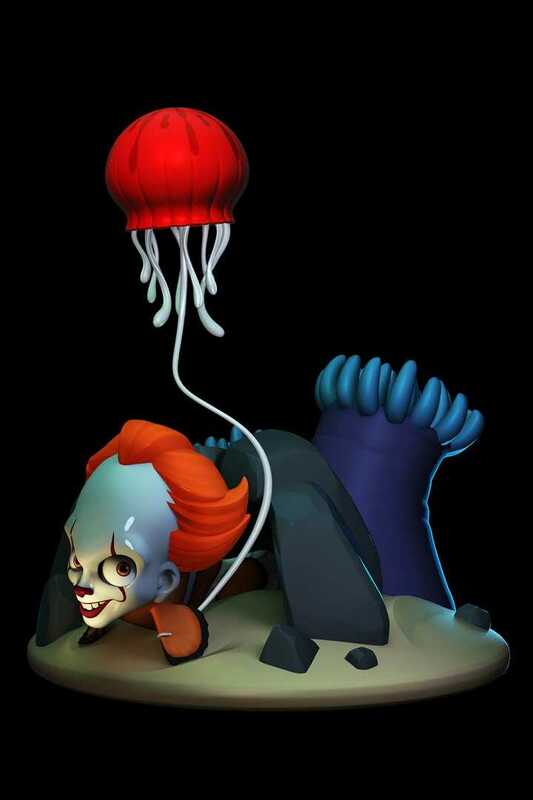 In particular, "Pennywise’s" head is wonderful! In addition, I love the color scheme and render. 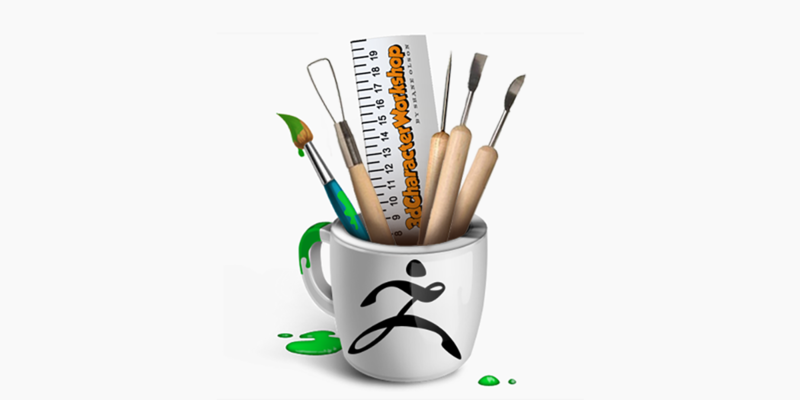 What to work on: The composition may need a bit of dynamism – all the parts are similar in size. And I’m kind of confused about the concept.